Computer Weekly cartoon of Richard in the 5th October 1995 edition. Richard was born in 1946. His paternal grandfather, Sir Percy Sykes, was a military man who had made the main part of his career in what was then called Persia (Iran nowadays) and was part of the British imperium, keeping an eye on British interests there. His father, Edward Sykes, who went to Oxford and was trained as a chartered accountant, then went in his father’s footsteps working in construction companies in Persia. His father was in wartime intelligence, where he met Richard’s mother (Naomi) and they were married at the end of the war. Richard was born in England but went out as a four-month-old to Persia where he then lived until the early 1950s, when his father decided they should move back to England. At that time Richard then got to know his maternal grandparents, also military by background. Neville went from the Army in India to be a rubber plantation supervisor in Malaya, and then, later in life went into the Church and became a Church of England vicar in Norfolk. Both his maternal grandmother and paternal grandmother were very classic ladies of their time, devoted mothers raising families. Richard went to a boarding school called Woodcote House in the depths of the Surrey countryside. That served to get him through the Eleven Plus. Essex, where they were by then living at the time, was short of grammar school places, so a deal was done to put him into a boarding school called Felsted in the Essex countryside, where part of the fees were paid for by Essex, since they couldn’t provide the grammar school place. Richard’s O level results were less than impressive and his father “read him the riot act” which resulted in a strong set of A levels and S levels in maths, physics, chemistry and biology. Richard was never very sporty at school and remembers knitting while watching cricket as he found cricket boring and being excused cross country running in the sixth form. His exercise was to cycle to different churches in Essex and play the organ for a couple of hours then cycle back. A lot of the teachers at Felsted were Cambridge men by background, so although his father had been an Oxford man and was doing his best to get him to Oxford, the local influence controlled the future, and Clare College at Cambridge asked him to join them. He sat for their scholarship exams and got a scholarship. And then, two years later at Clare, became a Senior Scholar. Richard read natural sciences, chemistry, biochemistry, maths and physics at Clare, as it seemed the obvious combination, given his O and A Levels. Richard got active with the Student European Society which was linked to an international pan-European body, and he had been to events that they had organised on the Continent. For Easter in 1967, with a group of student friends, they decided they would do the equivalent thing in Cambridge. They got sponsorship from a magazine (Encounter) and were able to bring 150 students from East and West Europe to Cambridge. And this was before the opening up of Eastern Europe, so it was very unusual. They had students from Poland and Czechoslovakia and Hungary, all communist governments, as well as from Germany and France and Italy and Spain, for a week-long series of debates and lectures, very good heavyweight speakers and things, based in one of the Cambridge colleges. Richard got a 2:1 and the college awarded him the Clare Mellon Fellowship which was a huge honour. That combined with a travel fellowship, got him to the States for two years and supported him for two years at Yale, and got him plugged into the Yale community. As a student, Richard got some exposure to computing as part of the work in physics and in chemistry when he learnt some basic programming using punch cards. When he got to Yale and his doctoral work, he was a heavy user of computing there for Fourier transform signal enhancement (see below). At Yale Richard studied for a PhD in biosynthetic chemistry which is the area where applied chemistry and how living cells do their chemistry come together. He had a very good time at Yale at the Department of Chemistry under the late Professor Harry Wasserman, who had in his portfolio of work a bacteria, a saprophytic bacteria (it loves damp carbohydrate environments) called Serratia Marcescens, noted for its bright red colour, due to a pigment called Prodigiosin. The classic way of doing biosynthetic chemistry up until then hadn’t worked with this bacterium. Richard came in at a time when there was an emerging technology called nuclear magnetic resonance spectroscopy (NMR), and for two years he used this to establish unambiguously the 21 peaks in the Progiosin NMR spectrum, each peak of which was one carbon atom in this complex molecule. Then in the final three months he fed carbon-13 enriched chemicals to the bug, purified the chemical Prodigiosin from it, and saw which peaks grew up in size, because that’s where the Carbon-13 was incorporated. So, the whole picture of how the bug was pulling together this complex molecule fell out in three months’ work because they had done that hard work for two years. Richard used the NMR machine connected to a big IBM computer at Yale Medical School to be able to complete the work – the Fourier transform signal enhancement. Richard also discovered that the Department of Computing, had developed an early version of word processing, so he typed the whole of his doctoral thesis on the PDP-11, and still has it on computer tape. Richard was lined up to go and do two years’ postdoctoral work at Harvard, with Professor Robert Burns Woodward. However, after going to see the work he would be doing he decided that all he would learn was how to do micro chemical synthesis without going out of his mind. A friend of his said, ‘Ralph Nader is looking for a scientist,’ because all his staff up until then were lawyers. “So I went down to Washington DC and met Mr Nader. And Ralph said, ‘Oh well, come along and join me.’ And he paid the princely sum of $5,000 a year, and Richard went and lived on $5,000 a year in Washington DC, working with his team. Ralph Nader’s background was that in the late Sixties, he had got access as a lawyer to a whole lot of material showing that General Motors had the in-house documentation to know that their cars had significant safety problems. And he wrote a book called Unsafe at any Speed, which was an attack on General Motors. And he was summoned to give evidence to a Senate committee, and General Motors, because he was a single man, put detectives on his trail to try to oppugn his character. So, the chief executive of General Motors was summoned to the Senate committee, and basically they said, ‘You’re trying to nobble our chief witness.’ And Ralph sued General Motors and got a multi-multi-multi-million-dollar settlement, which he used to establish the first public interest law firm in Washington DC. Ralph was particularly interested in the safety of cosmetics, regulation of cosmetics, ingredients in cosmetics and that’s what he wanted a scientist for. Things such as, for example, a lot of talcum powders having a lot of asbestos fibre in them. Towards the end of his second year with Ralph, for the elections in ’72, Ralph decided to do a very detailed exercise called the Congress Project. He asked everyone he employed to contribute by doing detailed studies of members of the Senate and Congress who were running for re-election. Richard agreed to do Senator Gaylord Nelson in Wisconsin and did a very detailed, 32-page report which the Wisconsin press said was the best thing they had seen on this important senator. It was two very interesting years but his visa said ‘after two years, you must leave and go back home’. So he did. ICI had an established research facility there, the Corporate Lab, that was at the centre of the whole company. And they had in it a small exercise called the Business Group, which were the people who worked with the scientists to see whether what they were developing had commercial potential. Being there served three purposes in Richard’s life at that point. The first one was that it got him settled back into the UK at a crucial time. The Corporate Lab was at Runcorn, and he settled into a small apartment in nearby Chester. It introduced him to a whole new circle of friends. The lab was a very lively place for scientists, creating all sorts of new stuff. But the commercial people were the people who then worked very closely with the scientists to try and work out what, the commercial potential of what they were doing. So the third purpose served – maturing his business experience. After three years there, he was being pursued by two businesses of ICI. One was the pharmaceutical arm at Alderley and the other was the petrochemicals arm on Teesside. Richard was confident he was going to pharmaceuticals, but they then hit a very bad performance period, and they said to him, ‘Well, we’ll stand by the offer, but if you’ve got a better offer elsewhere, you really might do better to go.’ So he went up to petrochemicals. At that time ICI were one of the largest manufacturers in Britain They were formed in 1926 by three independent chemical companies coming together to form a single entity that could face up to German competition. They employed about 180,000 people worldwide. The basis of ICI’s career development was that, once they had you ’in and adjusted’ (for which the Corporate Lab served its purpose), was that you then did three jobs in a row, each of about three years, one in marketing, one in selling, and one in purchasing. The idea was to develop a breadth of business experience. Richard’s first role was marketing ethylene glycol, which is the raw material for polyester (fibre and plastic) and for antifreeze. He spent a lot of time supporting the antifreeze market, developing ICI’s involvement in that. Off to places like Finland, with good winters, and he went back to Iran because they have very severe winters there. His next role was, based in the same division, Petrochemicals, and he was made Export Manager for North and South America for petrochemicals. There he was in a selling role, particularly in South America and was on the road, a month at a time, five times a year for three years. ICI then moved him to the role of procuring ICI’s energy in Europe, which meant natural gas, fuel oils and coal. The Petrochemicals Division had by then become Petrochemicals and Plastics Division, and that was then the first time he had a job where there were both short-term and long-term dimensions. ICI burnt a lot of fuel oil in its power stations and plants. “And we had contracts with the big fuel oil suppliers, like Shell and BP and they were pricing each contract with ICI in terms that basically said, ‘you will meet every three months and agree a price fixed for three months’ – so requiring a detailed understanding of the immediate term workings of the fuel oil markets. In contrast, developing his strategic thinking, Richard partnered with Malcolm Edwards, then Commercial Director of the (nationalised) Coal Board, to create an off-balance sheet scheme to convert ICI’s mid-Cheshire soda ash plant from burning oil to burning coal, sharply cutting their cost base. Then the time was right for Richard to move off into one of the ICI businesses. Richard moved on to ICI Films with a product called Melinex. It’s polyester film. ICI had developed it and DuPont had developed it, post-war, in competition with each other. ICI had manufacturing facilities at Dumfries in Scotland and in Holland, at Rozenburg, and in Wilmington, Delaware in the USA. ICI, in growing its use of computing, had become into two houses, a DEC house, which was exploited in the technology, manufacturing, and research environments, and IBM, which was exploited in the commercial and accounting environments. So it had created a document transfer system called EDT (Electronic Document Transfer) which bridged DEC and IBM. ‘You would have a single address, and you could create documents, and you could get the address of someone else in ICI and move the document to them, whether they were on DEC or whether they were on IBM’. So, without understanding the background to it at that stage, Richard found himself beginning to use technology for communications a lot. At ICI Films Richard was the commercial manager in Europe, helping develop the sales and the wider commerce of the business. But one of the things that he did was to travel regularly to Japan for developing Films’ sales in Japan. Richard made the case that, once the limitations of their licensing deals with Teijin had run out and they were allowed to go into Japan, that they should probably put a manufacturing plant in Japan. That then led him to being sent out to Japan from 1989-1992. ICI had made the investment case for a £55 million manufacturing plant, and he was sent out to implement that. From his position in Japan, he got to know what was going on in Korea. ICI (/Dupont/Teijin/Toray) had refused to license the technology to Korea. So the Koreans closed the border and gave sole rights to develop the technology, to Sung Kyong Chemical. And, it was clear to him, because he had visited Sung Kyong quite regularly that they were powering ahead. Within 10 years they overtook ICI, Dupont and the two Japanese in the polyester films business. The history was that the use of IT had grown up in the individual businesses of ICI through the Seventies, partly with IBM and partly with DEC. Under Sir John Harvey-Jones it was recognised that the result was becoming a bit of a mess, because each of the individual businesses were doing their thing differently. So a corporate function was developed that was given monopoly powers for the supply of computing and telecoms services to the ICI businesses. Computing was mainframe in those days and therefore, what that central function did, through the Eighties, was very value-adding. It rationalised all the data centres into one big data centre at Runcorn, with proper backup and failure cover. It got the telecoms network rationalised to a single global telecoms network based on telecom deals with people like BT and other suppliers round the world. There was also then an early relationship with the German software vendor SAP, because, when three Deutsch IBMers left Deutsch IBM to set up SAP, their very first client was Deutsch ICI. When Richard eventually took over, after shadowing his predecessor for a year he inherited 1,300 very techie techies and the strong data centre in Runcorn on this global telecom network. The team was very proud of what they were operating. The ICI businesses were less happy. However, things were changing and with his business eye Richard outsourced the telecom network and outsourced the data centre. Because of the SAP exercise, they had a team of about 100 very good SAP professionals and he bundled the data centre with the SAP team, and it went out as a single whole. By the time he had finished, he went from 1,300 corporate IT staff to 30. Richards title at that stage was Group Vice-President IT and although he had his set of offices very close to the board it was not regarded as a main board position. There was no IT professional on the board, so he was the highest ranking IT professional within the organisation. Richard was with ICI for 27 years and the final thing that ICI did, was that when it was clear he was going to need to move on, was to invest in having him given consultancy on how he might go forward, because he was going to be 53. 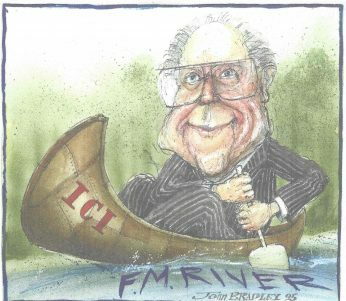 ICI had very kindly given him an opportunity to really understand the direction he should go, and that that direction said ‘use your experience to non-exec chair things, and be a strategist’. He also took on pro bono trustee roles in the arts, starting as chair of the trustees of the De La Warr Pavilion at Bexhill on Sea. Later he chaired the trustees of Cubitt Artists in London. Through his work at Morgan Chambers, Richard got drawn into the trade association for the IT, Telecoms & Electronics industries called Intellect (now TechUK). He became Chair of their outsourcing and offshoring group and did several reports for them on how to do that effectively in the modern world. 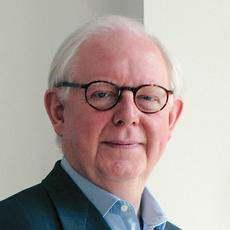 One of the key roles from his time with Intellect was to serve on a small working group with the Cabinet Office that set up the whole structure for G-Cloud (Government Cloud), the whole commercial structure that got taken up seriously by the Tories when they came into power, and which has encouraged the ability of the Government to buy from bright young new companies, rather than being over-dominated by the big boys, like an IBM or a CSC. Since the early part of this decade, Richard has been the Chairman of the Cloud Industry Forum (CIF). The Cloud industry was beginning to be a real powerful force. He then also became a judge for the annual UK Cloud Award. He also started working with a group of analysts called Bloor, very detailed technical analysts who have valued having a broad strategist to help articulate what they were doing. An example of Ricard’s work with his own clients was his role at UCAS, the body that provides the online services for people to apply to university. UCAS had developed very strong online capabilities using all their own computing power in Cheltenham. But what they found was, because they had this intense period in August where there would be one day when all the A Level results came out, that they were increasingly finding their computing capacity got overwhelmed. So UCAS set about a project, which Richard called the two-stage project. Stage one was to work with Amazon over a six-month period to just move enough of their special software onto Amazon cloud computing capacity to be able to handle the surge. Then there was Stage Two, a longer-term project to reshape all their computing software (now reworked as ‘cloud native’) onto Amazon and onto Microsoft Azure. UCAS is a charity, and its board of trustees were very nervous about the sheer size of change going through. Richard was asked to become their independent assurer. So over two years he regularly went to Cheltenham, talked to people, read the reports, and provided an evaluation to the chief executive and to the board of trustees, about whether they were on track and what problems they were going to hit. From his time at Felsted Richard remembers the late David Waddell who got him reading a fascinating book called The Rise of the Meritocracy (Michael Young), and it opened his thinking a lot. His boss in the Melinex business was Jim Park, and Jim was a very good leader of the Melinex business and Richard has remained in good touch with him: he was a very good teacher, a very good mentor. And, certainly someone who he held in respect and learnt a lot from. Then in Japan, it was Hiko Miyashita, who was a long-establish member of the ICI Japan board, and obviously very Japanese. And he was a very good guide and teacher to Richard in growing his capability to operate effectively in Japan. Richard has three things from his time at ICI that he was proudest of:. Thirdly was the pretty substantial transformation of ICI’s IT, so that by the time ICI was broken up, it had IT capabilities in the various businesses that were highly aligned to what they needed, and it was very much easier to break ICI apart accordingly. And then outside of the IT arena, the turning round of the De La Warr Pavilion. There was a group of volunteer trustees, who he chaired, working to save this lovely 1930’s building, owned and run by the local council. The local Council, in 2002, had a budget of about £10m, for 90,000 local citizens. And it was spending £1.5m on this one building. It was desperate to get rid of it. So Richard and his fellow trustees created a capability, with backing from National Heritage Lottery and National Arts Lottery that relaunched the Pavilion as a not-for-profit social enterprise, ensured that its dependence on the local Council was reduced to an annual £0.5m, which it was happy to back, with matching finance from the Arts Council. Richard advises two things. Read the Financial Times cover to cover every day, and read the Economist seriously once a week. Because the sheer coverage you get of a changing world between those two helps you be challenged and think hard about the environment you’re in. One other bit of advice that he gives, is that alongside your CV, you should always have a one-pager which is a kind of prospective view of where you think you really want to do and why. You CV looks backward: you need a well-thought-through one pager that looks forward!